The biggest problem with The Cured might be that the film bites off more than it can chew. At least in their modern post-Romero phase, zombies have often been a tool of social allegory. They are a potent metaphor for any number of familiar anxieties; unchecked consumerism in Dawn of the Dead, the working class in The Land of the Dead, an insurgent enemy population in 28 Weeks Later. In many ways, The Cured feels like a logical extension for this. The story about society trying to claw its way back from the horrors of zombie apocalypse, The Cured is a bold and ambitious piece of horror movie social commentary. A population of rehabilitated zombies raises any number of obvious parallels in the modern world. The Cured plays with a number of these ideas, using zombies as a metaphor for class anxieties and for a politically subjugated (and literally dehumanised) political population. However, the most potent metaphor at the heart of the story is to do with criminal rehabilitation and social reintegration, the challenge of how society embraces or shuns those who have committed horrible acts but are also deemed to have served their time. Writer and director David Freyne explores these ideas in a charged and playful manner, balancing the expectations of zombie storytelling against the backdrop of a broader political allegory. Indeed, The Cured arguably suffers from a surplus of good ideas, with enough material to sustain a television miniseries crammed into a lean ninety-five minute runtime. Season three begins. Kind of. The Chute was the first episode produced for the third season. Basics, Part II and Flashback aired as the first two episodes of the season, but they had been produced towards the tail end of the second season and held back so that Star Trek: Voyager could launch its third season in early September. It was a smart strategy for the production team and UPN, but it did mean that there was a lot of holdover from the second season. Although the production team had wanted Basics, Part II to be the end of the Piller era, his ghost lingered on. In some ways, the ghost of Michael Piller still haunts The Chute. The episode was produced after Piller’s departure, but writer Kenneth Biller credits the idea to the former executive producer and it feels very much in keeping with some of Piller’s pet fascinations and ideas. At the same time, The Chute does signal the beginning of the third season. It marks a point at which Voyager feels a lot more comfortable in its own skin, and where it feels like the writers have a clear grasp of what they want the show to be. If the second season was a collection of misfiring experimental concepts and bold new directions, the third is markedly more conservative in its style and tone. The Chute is an episode of Voyager that is aiming squarely for an archetypal science-fiction allegory, and which manages to deliver on those terms. It is not necessarily ambitious or exceptional, but it manages to accomplish what it wants to do. What it wants to do is to be a very broadly-drawn (but recognisable) piece of Star Trek. The Thin White Line is the final script from James Wong and Glen Morgan for this season of Millennium, following closely after Never Again, their final script (ever) for The X-Files. Indeed, there is considerable overlap between the two stories – at least thematically. Both are episodes about destructive cycles. 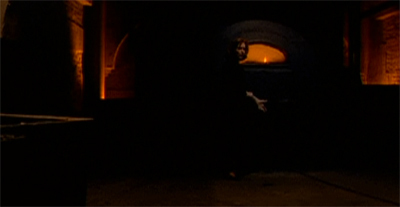 In Never Again, Scully faces the very real possibility that she is now trapped with Mulder; that her life outside the X-files is over. In The Thin White Line, Frank Black contemplates the idea that people are trapped in perpetual cycles of violence and abuse; that the world resembles the ouroboros featured so prominently in the opening credits, a snake constantly eating its own tail. Never Again is relentlessly cynical. The closing image suggests that nothing will change, that something is broken than cannot be fixed. Important statements hang in the air, unresolved. The Thin White Line is perhaps slightly optimistic. Both Frank Black and Bob Bletcher try in their own way to end cycles of violence and recrimination. While Bob Bletcher responds with brutal cynicism and more violence, Frank Black responds with compassion and humanity. There is a sense of cynicism to The Thin White Line, but there is also some hope. The Thin White Line is a stand out piece of work, a fantastic illustration of what Millennium can do when it sets its mind to it. Like Force Majeure before it, The Thin White Line suggests that Millennium has very clearly and definitely figured out its own voice. It is no wonder that both episodes come from future showrunners. 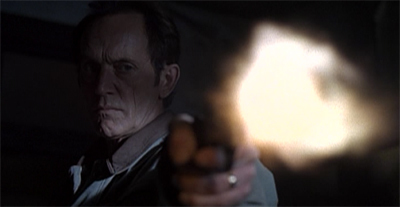 The wonderful thing about the second season of The X-Files is the spirit of experimentation. There’s a sense that the show is consciously pushing itself to try new things, to figure out what works. Watching the second season of the show, you can see the series’ outline beginning to take shape, even if it’s not full developed yet. The third season of The X-Files would seem a lot stronger and more cohesive, but it was building off the lessons learned during the second season. Sometimes those experiments worked well. For example, the first stretch of the season demonstrated that the show could do an arc spanning multiple episodes. Colony and End Game established the foundations of the larger “colonisation” mythology even beyond “the government knows about aliens and they sometimes abduct people.” Episodes like Die Hand Die Verletzt and Humbug demonstrated that the show could do comedy stories and step outside its comfort zones. Has everybody caught the Ebola bug? Of course, there were a few narrative dead-ends as well, a few experiments that did not work as well as they might. Most notably, the tail end of the season leans rather heavily on science-fiction high-concepts. The elements introduced in Colony and End Game work well enough, but shows like Soft Light and Død Kälm feel almost like episodes of some other science-fiction anthology show. Still, there’s a sense that the show is trying to figure out what exactly it wants to be. F. Emasculata is a wonderful example of that spirit of experimentation, effectively tapping into nineties health scares within the framework of a conspiracy thriller. This film was seen as part of the Jameson Dublin International Film Festival 2012. It was the first “surprise” film. Will Ferrell’s Casa De Mi Padre is perhaps the most esoterical comedy ever produced. The comedian has his legion of loyal fans, but it’s difficult to imagine that there’s a large crossover between those who enjoy Ferrell’s work and those with an affection for Mexican telenovelas. Filmed in “Mexico Vision”, with pretty much all of the dialogue in Spanish (rather than, as one DEA agent puts it, “American”), the movie displays an astonishing commitment to its basic premise, which is effectively one joke sustained over its runtime. I can sense already that Ferrell’s latest project will be his most divisive to date, dividing film fans into “love it” or “hate it” camps. I fall strongly into the former. This film was seen as part of the Jameson Dublin International Film Festival. A Somewhat Gentle Man was a very pleasant little surprise to catch on the last day of the Jameson Dublin International Film Festival. It’s a delightfully dark Norwegian comedy about a man recently released from prison, trying to make his way in the world.